THE SATYROI HERMEIDES were three satyr-messengers of the god Dionysos named Pherespondos, Lykos and Pronomos. "[The goddess Rhea summoned rustic divinities to the army of Dinoysos for his campaign against the Indians :] The horned Satyroi (Satyrs) were commanded by these leaders [various Satyr sons of Seilenoi (Silens) are named] . . .
With Pherespondos (Pherespondus) walked Lykos (Lycus) the loudvoiced herald, and Pronomos (Pronomus) renowned for intelligence--all sons of Hermes, when he had joined Iphthime to himself in secret union. She was the daughter of Doros (Dorus), himself sprung from Zeus and a root of the race of Hellen, and Doros was ancestor whence came the Akhaian (Achaean) blood of the Dorian tribe. To these three, Eiraphiotes [Dionysos], entrusted the dignity of the staff of the heavenly herald, their father the source of wisdom." "[At the start of Dionysos' war against the Indians :] Bakkhos (Bacchus) [Dionysos] sent two heralds to give proclamation of war, either to fight or to fly: and with them went goatfoot Pan, his long-haired beard shadowing his whole chest . . . The heralds of Bromios [Dionysos] departed [from the Indian camp], for Astraeis [a general of the Indian king] drew near them contemptuous, with pitiless menace on his tongue. Furiously he chased away Pan and the oxhorned Satyroi (Satyrs), despising the heralds of Dionysos when he was gently. They turned with timid foot, and made their way back in flight to Dionysos now in warlike mood." So he spoke, and the herald on swift shoes holding his father's rod travelled from land to land, until he made his way to the Eastern country." 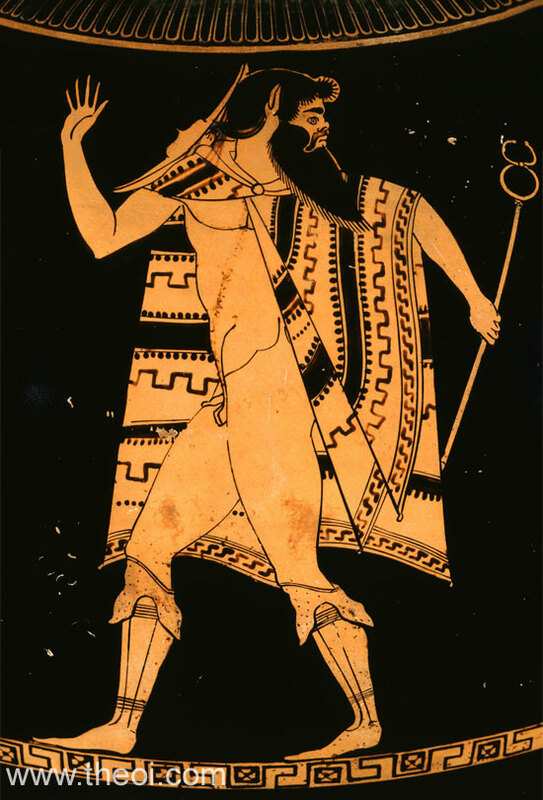 This said, he dismissed him with threatening looks, after quickly scribbling this message within a tabled with two folding sides : ‘Take arms against Deriades if you can, Dionysos.’ Such words as these the loudvoiced herald heard and departed. He found the Seilenoi in high glee: Dionysos had come up out the waters . . . They were enjoying themselves as the herald came back, safe and sound, and greatly desired by Bakkhos rejoicing. He reported the highnecked folly of Deriades, and carried the double tablets pregnant with war."